John Collier was born at Ballarat in 1937. He received a Diploma of Mining and a Diploma of Civil Engineering at the Ballarat School of Mines (SMB). John Collier later graduated from the University of Melbourne with a Bachelor of Engineering (Mining). Early in his career he received a Diploma of Accountancy from the Australian Society of Accountants. John Collier believes his experience at SMB had a profound influence on his life, especially what he learnt in Geology, Engineering, Chemistry, etc., all of which he found beneficial to his later working life. He is proud of his association with the Ballarat School of Mines. 1997 April - Chief Executive, Gold and Other Minerals Product Group, Rio Tinto plc, London. The group of 22 operations included Norzinc (zinc smelting); Angelsey (aluminium smelting); Corumba Brazil (iron mining); Fortaleza Brazil (nickel flash smelting); nickel refining, Zimbabwe; Coal operations, Brazil, plus several development opportunities in Zimbabwe, Philippines, Brazil and Australia. His portfolio included several large gold operations such as Lihirn (PNG), Kelian (Indonesia), Paracatu (Brazil), and Peak (NSW). 1996 June - Head of World-Wide Exploration Rio Tinto Group, London. 1989 August - Seconded to RTZ London as Head of Exploration. 1982 July - Group Executive in charge of exploration and mineral resource studies. 1975 July - General Manager, CRA Exploration, Melbourne. 1972 April - General Manager, CRA Oil and Gas Group and Chief Executive of IOL Petroleum Ltd, Melbourne. 1970 October - Manager, new Projects, Hamersley Iron P/L, Melbourne. 1969 - Assistant Trade Commissioner, Australian Government, New York. 1969 September - Department of Trade and Industry, Canberra. 1967 - Assistant Manager, Engineering, Hamersley Iron P/L, Melbourne. 1965 September - Administrative Assistant to Managing Director, Hamersley Iron P/L. 1964 September - Transferred to marketing Department, Comalco Ltd, Melbourne. 1963 - Mine Planning Department, Zinc Corporation, Broken Hill, NSW. 1962 - Exchange Engineer, Mitsubishi Metal Mining Corporation. 1960 - 1962 - Zinc Corporation, Broken Hill, NSW. This included underground experience and Survey Department. 1. Have high standards in your technical, commercial and personal activities and surround yourself with people of the highest calibre. 2. Engender confidence in your various teams. Confidence breeds success and success breeds success. 3. Don't be afraid to hire and train good, young people. They are your lifeblood! 4. Have short lines of effective, well defined responsibilities and effective accountabilities. 5. Make the best 'continental area selection" and keep the exploration targets simple, but high. 6. Take measured risks in exploration. You have to lose to win. 7. Look backwards before going forwards. 8. Get off failing programmes as soon as they are recognised. Don't put good money after bad. 9. Don't engage in 'tail end Charlie' style exploration. Be a leader and pioneer in area selection. John Collier died in 2012. This biography researched by Clare Gervasoni, January 2007, updated in June 2008 (with thanks to John Collier). Image Caption (RHS): John Collier from the 1955 SMB Students Magazine. 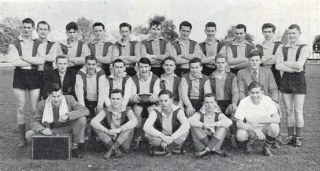 Image Caption (LHS): SMB Football Team, 1955. Standing l-R: B. Gallagher; N. Brogden; J. Simpson; J. McArthur; D. Vendy; F. Pomeroy; J. Wolfe; B. Singleton; W. Widdop; J. McKay; P. Collier. Centre Row L-R: B. Dunstan; R. Cutter; B. Tozer (Vice-captain); J. Clelland (Captain); I, Schunke; B. Bellingham; N. Hails; P. Robinson.